A particular focus of this project aims to better understand economic and social co-benefits of these streetscape features. This analysis will provide vital background information and supportive data for planners, transportation professionals, advocates, and policymakers working in support of community design that encourages physical activity. 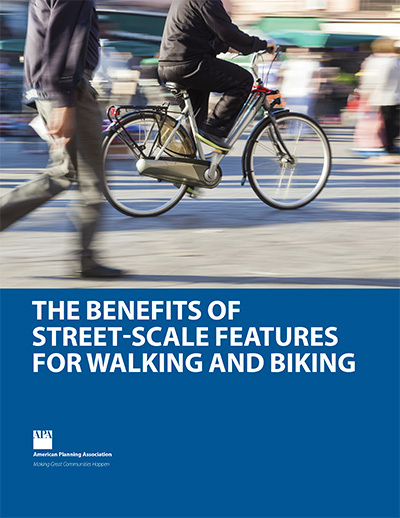 This funded research project studied the benefits of street-scale features for walking and biking. PCH examined how different street features, either independently or in combination with one another, promote or discourage physical activity. It will allow these individuals to point to specific street-scale built environment features that promote walking and biking, and highlight the co-benefits for each feature. Active Living Research, partially funded by the Robert Wood Johnson Foundation, aims to translate and disseminate evidence to advocates, policymakers, and practitioners aimed at preventing childhood obesity and promoting active communities.